Since 2013, Comedy Heights has been a free weekly show featuring top standup talent in SoCal and from around the country. 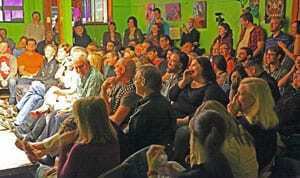 In a small room in University Heights next to Twiggs Coffeehouse, audiences have been delighted by our weekly lineups of clean and clever comics, assembled by prominent local comedians and producers, Al Gavi and Maria Herman. Each show is curated to feature PG-13 comics so that all ages can enjoy our shows. We take no reservations and have first come first serve seating that often fill to capacity. Every Saturday at 8PM, bring your own food and beverages and arrive early for the best free comedy show in San Diego! Previous story February 8th and 9th Comedy Heights! Daniel Eachus!